From the rainforest in the Darien come these unique hand made Wounaan and Embera baskets. They are consider one of the finest baskets in the world. The Wounaan Natives from the rainforest in the Darien and the Embera Indians are master artisans and create these fine woven baskets or plates in quality colors, design, symmetry and balance. The women are known for the baskets and the men for the Cocobolo Wood and Tagua. 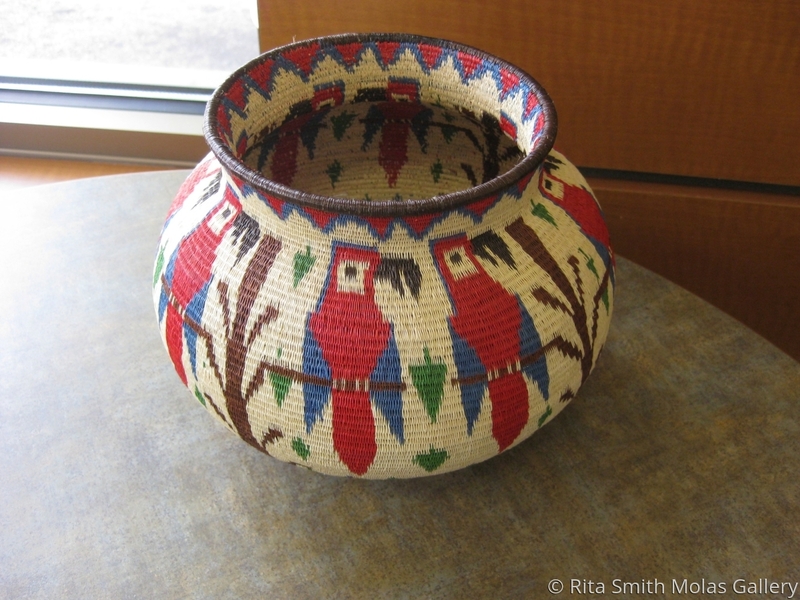 The baskets or plates were hand woven using natural fibers found in the forest. A variety of reeds are normally used. The colors are produced with natural extract of plants and earth, using the traditional method of dying the basket fibers. They portray insects, animals or life in the village. This basket is 7.5" height, around the body 29", at the top end of the basket 18", it has 2 different designs birds and butterflies in the bottom, colors are very light cream, brown, green, red and blue, all the colors blend together, item is better than actual picture, decorate your office or home. The bottom of this basket is amazing!!! Yes, I can send you pictures. Income earned from the sale of this lovely basket reduces the need to destroy the rain forest for agriculture. The artist is a wounaan Indian and her name is Maria Sinforiano.